A brief re-cap of the last week: I went to Istanbul! The street I stayed on just off Taksim square. What a magical land! I visited friends and ate so much stupidly good Turkish food, like BAKLAVA and endless breakfast spreads and the weirdo-drinkable-salty yogurt called Ayran. I took a great many pictures, one of which is above, and generally relaxed. It was perfect. And now I'm writing from the back-pain-ridden aftermath of a 3-day marathon of screen printing. Since Tuesday, I've been in and out of Stattbad, the glorious derelict public swimming pool building that houses a screen printing studio and black and white darkroom, among other things. The sensations I'm feeling can only be described as exhausting and exhilarating, with an undercurrent of starving, as I only managed to eat furtive handfuls of granola pretty much all day. (Aside: I just got home, and before housing a bunch of bread and olive oil, I literally stuffed lunch meat into my mouth. I'm not a lunch meat girl, but DAMN IT WAS GOOD). But this, my friends, is bliss. Look at this place. Awesome right? I've met lovely people here, and managed to make some decent prints. All the stuff I printed. 1. Kickstarter rewards, or at least a portion of them (October Amy will thank August Amy for this). 2. Work to be shown in conjunction with the other residents' work on August 29th. I am collaborating with another resident, a painter, on a sort of "set" for a dance performance by another resident at our opening. This dancer wants to be in a tight space, limiting his movements, so we are throwing ideas around of making him a light box to dance in within the gallery. The walls might have the screen printed letters in the above picture on them. Golden record aboard the Voyager. 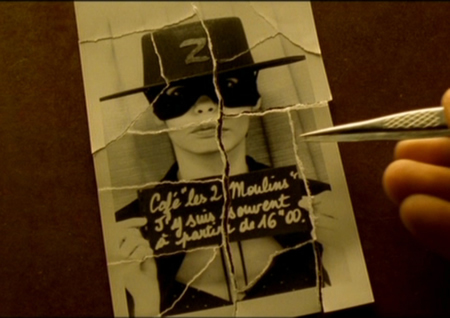 ...and the ransom-style notes and treasure-hunt aspect to the movie "Amelie:"
Cute guys pieces together sweet picture of Amelie holding a sign telling him where to meet her. Le sigh. So, I see the Voyager and Amelie as related. Both are hoping to be found. Voyager, with its soundtrack of Earth aboard, hopes to be found by an alien race that may or may not exist, but whom we hope will listen to the record, learn about our planet, and maybe plot a path to visit us; Amelie is trying to win the heart of a man she's never met by leaving him clues about her, sending him ransom-style notes, and generally sending him on a wild goose chase. Both are beautiful stories, and very romantic. And both hope not only to be found, but to be understood by whomever finds them. I also think this can relate to the world of online dating, something I find wholly unromantic in its algorithms and search criteria, however practical and modern it is. But I think there's something there in all this mess of ideas. If I get a good start on this work before I leave Berlin, I'll be happy. Thank the heavens for this residency. And with that, I am going to sleep the pure, rock-like sleep that only a starving, exhausted artist can achieve.